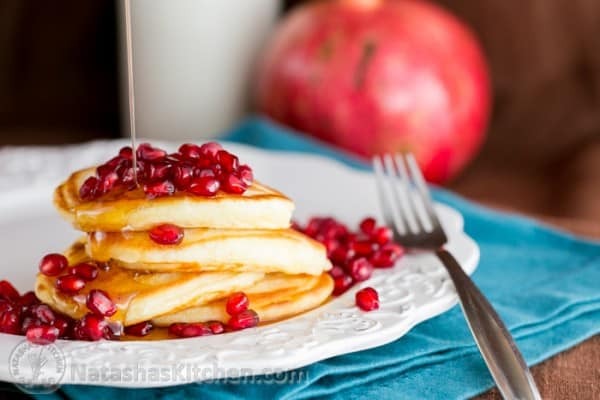 These buttermilk pancakes are ready in about 30 minutes! There’s no yeast which means: no rising time required. 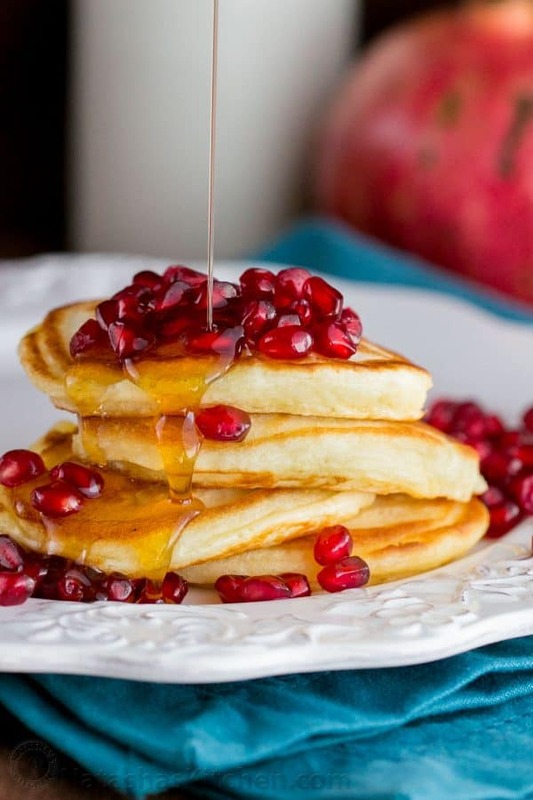 This recipe is so easy and the pancakes turn out fluffy and delicious; perfection. Everywhere we go, great recipes are drawn to us like fruit flies on melons. I ain’t complainin’! My Mama-in-law made these for us on a recent trip to California and we all just gobbled them up. My son ate a bunch of them too. We knew we had to have the recipe and couldn’t resist sharing it with you. You’re gonna love ’em! 1. 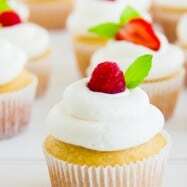 In a large mixing bowl whisk together the dry ingredients: 2 cups plus 2 Tbsp flour, 1/2 tsp baking soda, 2 tsp baking powder, 1 Tbsp of sugar and 1/4 tsp of salt. 2. 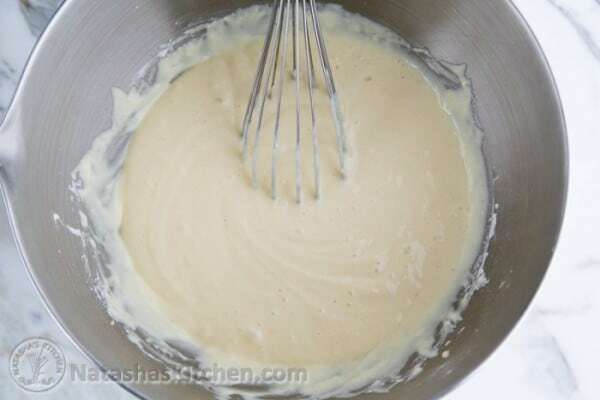 In a separate medium mixing bowl whisk together wet ingredients: 3 eggs, 2 cups buttermilk and 1 Tbsp melted butter. Heat a large heavy-bottomed skillet over medium/high heat and add 2 Tbsp oil (we used extra light olive oil). 3. 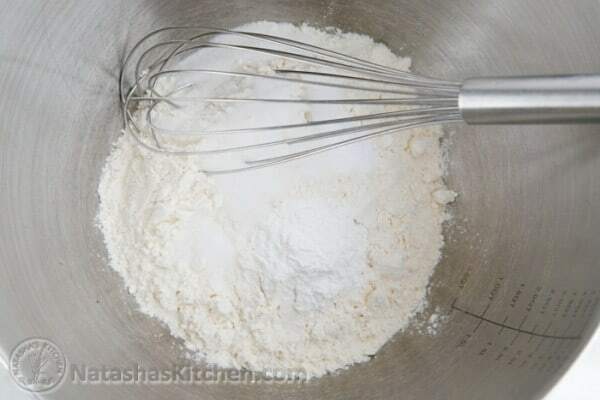 Add wet ingredients to dry ingredients and whisk everything together by hand until well combined. 4. Add a heaping Tablespoon of batter to the preheated skillet and saute about 4-5 of them at a time for a 2 minutes per side. Don’t crowd the pan or you will have 1 giant pancake, unless that’s what you’re going for. 5. 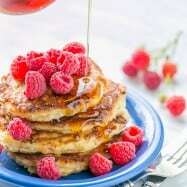 Remove finished pancakes from the skillet and serve warm. Repeat the process with the rest of the batter. 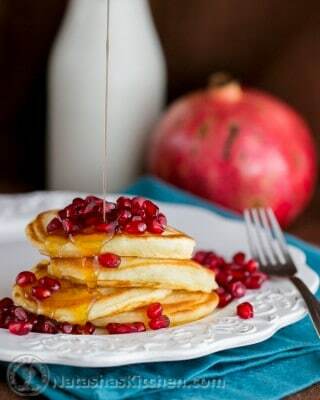 And why not toss some pomegranate seeds on top along with a generous downpour of real maple syrup? 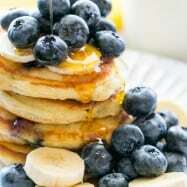 What are you making for breakfast? Is there anything cool you make for the holidays? Breakfast traditions are the best, aren’t they? 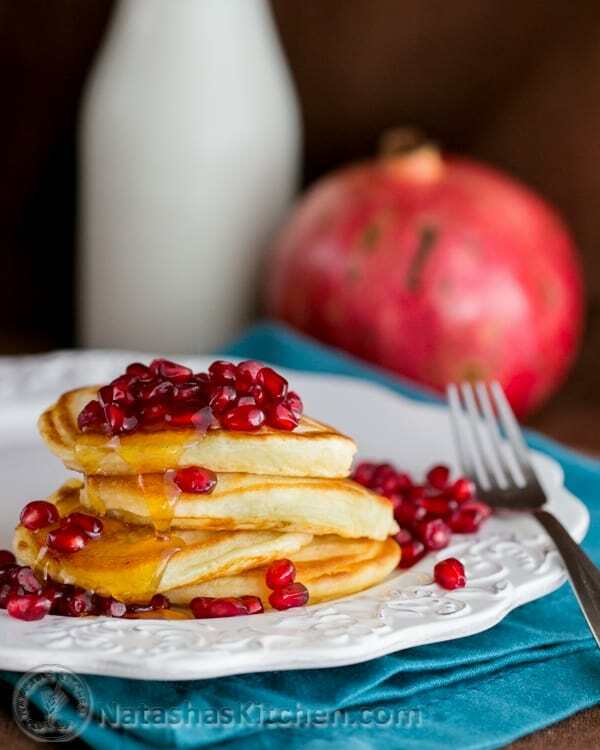 These buttermilk pancakes are ready in about 30 minutes! There's no yeast which means: no rising time required. 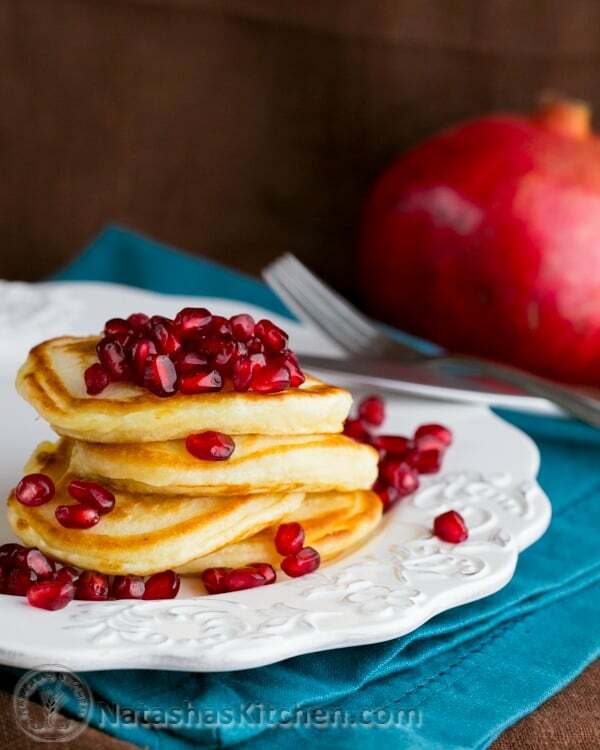 This recipe is so easy and the pancakes turn out fluffy and delicious; perfection. 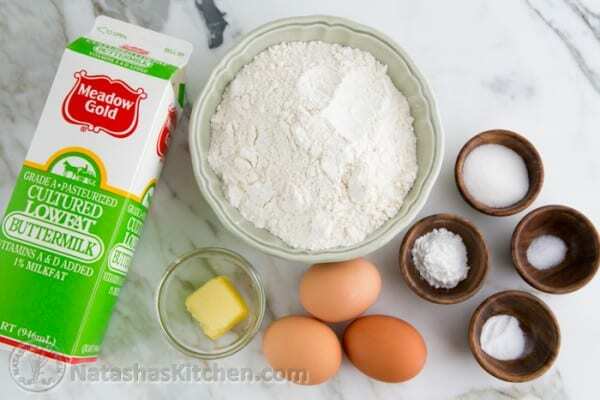 In a large mixing bowl whisk together the dry ingredients: 2 cups + 2 Tbsp flour, 1/2 tsp baking soda, 2 tsp baking powder, 1 Tbsp of sugar and 1/4 tsp of salt. 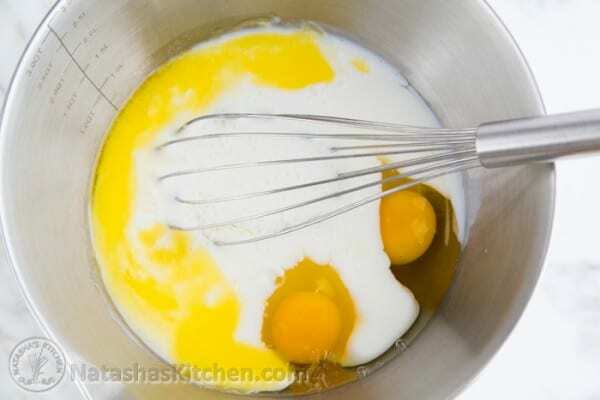 In a separate medium mixing bowl whisk together wet ingredients: 3 eggs, 2 cups buttermilk and 1 Tbsp melted butter. Add wet ingredients to dry ingredients and whisk everything together by hand until well combined. 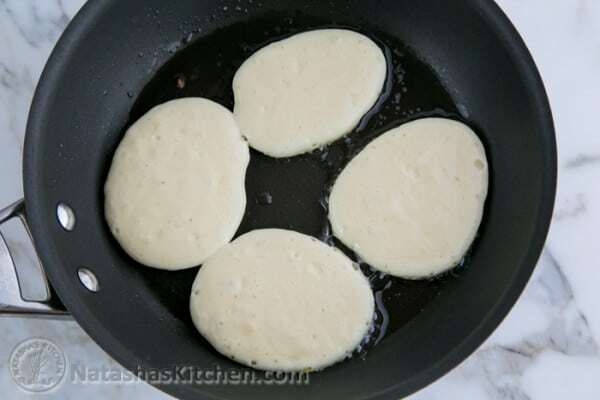 Add a heaping Tablespoon of batter to the preheated skillet and saute about 4-5 of them at a time for a 2 minutes per side. Don't crowd the pan or you will have 1 giant pancake, unless that's what you're going for. 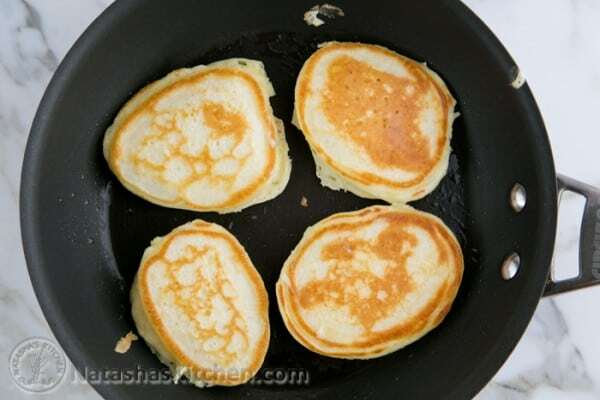 Remove finished pancakes from the skillet and serve warm. Repeat the process with the rest of the batter. Serve warm. 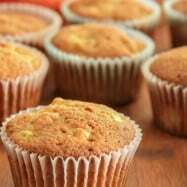 Can I make them with white whole wheat flour? Do you think they could me made on electric gridle? I just made these pancakes and they were perfect! Exactly what I was looking for – not too sweet, very airy and with fantastic taste. My family was excited. Just made these and they were fantastic. Little tip, I didn’t have any baking soda, so I just added slightly more baking powder. 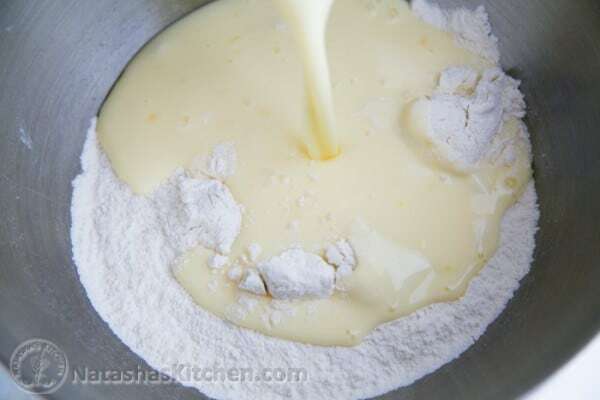 When I mixed the dry and wet it ended up being too thick so I just put in 1 – 2 tablespoon more buttermilk and the mixture thinned up enough. First of all, this pancakes are amazing. We do them every weekend. Thank you for the recipe. I was wondering if there is a way of cutting in half the recipe? Would we use 2 eggs instead of 3? Sometimes they are too many and I have tried to save the batter for next morning and for some reason it starts having green spots so I have to toss it. your site is my number one source when it comes to having quests or everyday cooking. I have to try it today for dinner. Yeah for dinner. My kids eats sometimes breakfast meals for dinner. 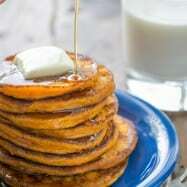 I hope they will end up delicious and I will not taste baking soda in those fluffy pancakes. THANK YOU Natasha so much for this recipe, they are delicious! I have been trying to make oladi/blinchiki without a recipe (you know how it is with our moms!) and they mostly turned out firm or flat; these are perfect! I actually made a couple substitutions and they still turned out great, so next time will try it by your recipe exactly and see what the difference is. 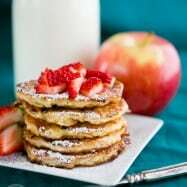 I was just wondering if it would be ok to add a small piece of apple to each pancake. Would it fall apart? Do you have a recipe for turkey? I am hosting Thanksgiving in my house this year and I am making the turkey. I looked around for few recipes, but nothing that I like. Since all your recipes come out amazing, I was just wondering if you might have a recipe for Turkey? You are a recipe magnet! 🙂 You readers aren’t complaining, because you get to share them all with us.